In this breakthrough work, Juan Gris combined indoor and outdoor views within the same painting. The artist achieved this blend of interior and exterior through interrelated pictorial elements and subtle modulations of color, including an intense, unearthly blue that suffuses the work with a dreamy softness. The foreground contains a still-life arrangement featuring a newspaper, book, wineglass, carafe, compote, and bottle of Médoc wine on an upturned tabletop. These objects are refracted through shafts of colored light from the open window that bring the neighboring houses and trees into the composition, as well as the canopy of leaves that frames the top of the picture like an umbrella. 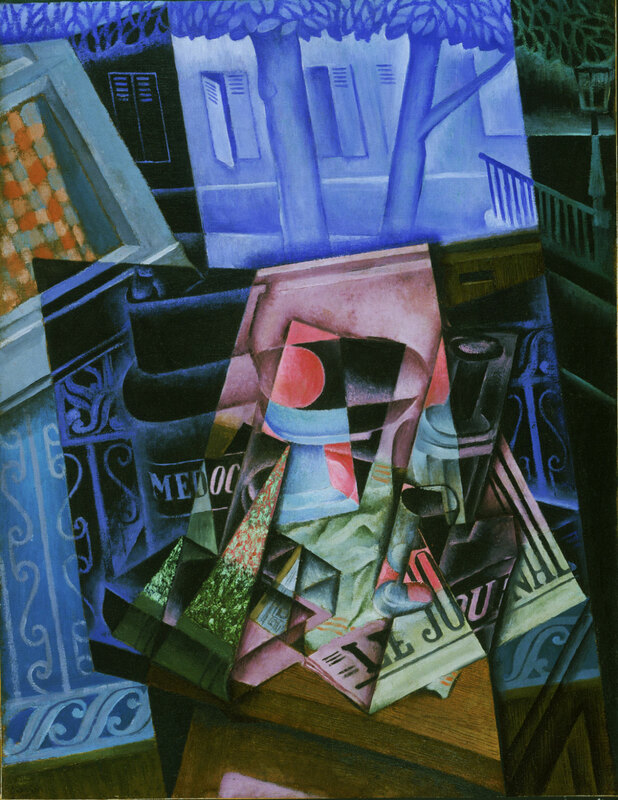 Picasso and the Avant-Garde in Paris: Juan Gris' "Still Life before an Open Window, Place Ravignan"
In early 1915, Juan Gris realized that at last his paintings were no longer the mere inventories of objects of which he long had despaired. His works now presented newly unified structures of interrelated pictorial elements, despite their densely complex compositions. Indeed, in Place Ravignan, Gris weds interior and exterior, still life and landscape, even day and night. The title refers to Gris's Paris address, and the painting presumably presents his own daily view from his studio. Traditional elements of still life--newspaper, glass, carafe, compote, bottle, and book--are arranged on a table, but refracted in great shafts of light from the window that bring the neighboring trees and houses into the composition. The umbrella of foliage on the trees and the wrought iron designs of the balcony gather background and foreground into one dreamlike sweep that revels in intense color, evoking the artist's close association with Henri Matisse. Gris, by nature an exacting artist, has here let calculation make room for a poetry and sensuousness rarely so explicitly revealed in his work. Ann Temkin, from Philadelphia Museum of Art: Handbook of the Collections (1995), p. 313. Gris's Still Life Before an Open Window, Place Ravignan reveals the artist at the height of his powers, expertly balancing lyricism and geometric rigor in a composition of evocative spatial juxtapositions and luxurious color. Its harmonious balance of dense pockets of animated, fractured space and flat areas of simplicity and tranquillity reflects Gris's talent and experience as a brilliant maker of Cubist collages. The resplendent colors and subject, a view through his studio to an open window and the street, hint at Gris's recent friendship with Henri Matisse and the mutual exchange that shaped both artists' work at this time. Gris's innovations lie in his extension of the Cubist premise of interlacing planes to encompass the relation of interior and exterior spaces. In rendering the indoor still life, Gris elided distinctions between a compote, glasses, a wine bottle, a newspaper, and a book. The table is meticulously painted to imitate wood graining. This detail makes reference to the trompe l'oeil painting and pasted papers in Picasso's and Braque's Cubist works. But whereas those elements often float independently from objects in their paintings and collages, Gris reasserted the connection between the pattern and the table to which it adheres. The word "journal," elongated to rhyme with the faceted striations on a water jug, is but one indicator of the elasticity of signs and objects in the picture. The flat, repeating arabesque pattern of the balustrade links the plane of the still life and that of the building facade, railing, and streetlight. The blue light bathing this distant scene suffuses its taut formal dynamics and visual compression with a dreamy softness, as does the inclusion of an unexpected natural element, a canopy of trees, to frame the composition. Twentieth Century Painting and Sculpture in the Philadelphia Museum of Art (2000), p. 34. With Léonce Rosenberg, Galerie de l'Effort Moderne, Paris (stock no. 5115, photo no. 1129), possibly still in 1931 ; Pierre Faure, Paris, by 1933 ; sold to Louise and Walter C. Arensberg, Los Angeles, through Marcel Duchamp as agent, 1938 ; gift to PMA, 1950. 1. Carl Einstein, Kunst des 20. Jahrhunderts, Berlin, 1931, p. 639, no. 374, as "Paris, Galerie Léonce Rosenberg." The photo number is cited in Douglas Cooper, The Essential Cubism: Braque, Picasso & their Friends, 1907-1920 (exh. cat., London, Tate Gallery),1983, no. 70, p. 162. 2. Zürich, Kunsthaus, "Juan Gris," 1933, no. 53, lent by Pierre Faure, Paris; Faure's name also appears on the back of the painting. According to Cooper, Faure formed his large collection of 26 paintings by Gris between 1915 and 1927, buying from Léonce Rosenberg. Some 21 oil paintings owned by Faure appeared in the 1933 Zürich exhibition (all pre-1920). Cooper states that the entire collection was acquired by Kahnweiler's Galerie Simon in Paris in 1933 (Cooper, The Essential Cubism, 1983, pp. 25, 31); however, none of the Arensberg Gris paintings, all from the Faure collection, have Galerie Simon labels. This suggests that Duchamp acquired them directly from Faure (see note 3). 3. Provenance notes made for the Arensbergs by Marcel Duchamp, dated Sept. 8, 1951 (PMA, Arensberg Archives), state that this and the other four paintings by Gris in the Arensberg collection were acquired as a group from a "private collection" (Faure's). See also Seligmann Galleries exhibition, "Juan Gris," 1938, lent by Mr. and Mrs. Walter C. Arensberg.